Hyperbilirubinemia is the accumulation of bilirubin, a brownish-yellow compound that is formed when old or damaged red blood cells are broken down. Normally, bilirubin is chemically altered by the liver so that it can be safely excreted in stool and urine. However, if your red blood cells are being broken down at an abnormally high rate or your liver isn't functioning as it should, hyperbilirubinemia can occur. In infants, this can simply be due to the body's inability to perform the task of clearing bilirubin well in the first days of life. In anyone, however, the condition may be indicative of disease. Complications may occur, primarily in newborns, if bilirubin levels become toxic in the brain. This can lead to a condition known as kernicterus in which seizures, irreversible brain damage, and death can occur. There are many different reasons why hyperbilirubinemia may occur. The causes can be broadly broken down by the type of bilirubin involved. Conjugated bilirubin is unconjugated bilirubin that has been altered by the liver to make it water-soluble and more readily passed in urine and bile. Moreover, some drugs can induce hyperbilirubinemia by impairing liver function, often in tandem with underlying liver dysfunction or as a result of prolonged use or overuse. These include certain antibiotics (like amoxicillin and ciprofloxacin), anticonvulsives (like valproic acid), antifungals (like fluconazole), oral contraceptives, statin drugs, and Tylenol (acetaminophen). Even certain herbs and herbal remedies are known to be highly toxic to the liver, including Chinese ginseng, comfrey, Jin Bu Huan, kava, kombucha tea, and sassafras. Hyperbilirubinemia can be diagnosed with a blood test. The test measures the level of total bilirubin (both unconjugated and unconjugated) and direct (conjugated) bilirubin in the blood. The indirect (unconjugated) bilirubin levels can be inferred from the total and direct bilirubin values. In newborns, a normal value would be an indirect (unconjugated) bilirubin of below 5.4 mg/dL within the first 24 hours of birth. Bilirubin is often included as part of a panel of tests which evaluate liver function and enzymes, including alanine transaminase (ALT), aspartate aminotransferase (AST), alkaline phosphatase (ALP), and gamma-glutamyl transpeptidase (GGT) bilirubin. Additional tests may be ordered to pinpoint the underlying cause of the dysfunction, particularly in the presence of jaundice. A urinalysis may be ordered to evaluate the amount of bilirubin excreted in urine, offering doctors a clue as to the location of the problem. Imaging tests such as an ultrasound and computed tomography (CT) are especially useful as they can help distinguish between a biliary obstruction and liver disease, including cancer. Ultrasound can do so quickly and without ionizing radiation. CT scans are more sensitive in detecting abnormalities of the liver or pancreas. A liver biopsy would only be used if there is already a firm diagnosis of cirrhosis or liver cancer. Irrespective of the underlying cause, bilirubin testing would typically be repeated to monitor your response to treatment or to track the progression or resolution of a disease. If your bilirubin levels are raised, your doctor will want to identify the underlying cause. It is important to remember that hyperbilirubinemia is not a disease per se but rather a characteristic of a disease. Pre-hepatic causes are differentiated by the lack of bilirubin in the urine (since unconjugated bilirubin cannot be excreted in urine). In addition to a panel of red blood cell tests, your doctor may request a bone marrow biopsy or aspiration if cancer or other serious diseases are suspected. In terms of symptoms, the spleen would likely be enlarged, while the stool and urine color would be normal. Hepatic causes are characterized by elevated liver enzymes and evidence bilirubin in the urine. Imaging tests such as an ultrasound or X-ray may be used to see if the liver is inflamed. A liver biopsy may be recommended if there is evidence of cirrhosis or liver cancer. Genetic testing may be used to distinguish between the different types of viral hepatitis or to confirm genetic disorders like hemochromatosis or Gilbert's syndrome. Spleen enlargement would be expected. Post-hepatic causes are characterized by normal unconjugated bilirubin levels and a normal spleen. A computed tomography (CT) scan may be used to identify gallstones, while an ultrasound and stool tests may be performed to detect abnormalities of the pancreas. In the end, there is no single test that can differentiate the underlying causes of hyperbilirubinemia. Treatment would be directed by the diagnosed condition and can range from the termination of a toxic drug to surgery and long-term chronic therapy. The treatment of hyperbilirubinemia depends on the underlying cause. The condition is not treated in isolation. 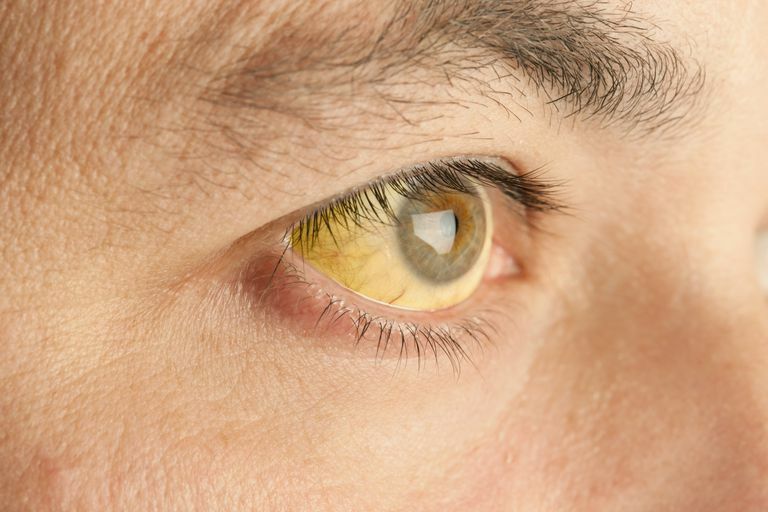 Jaundice in adults may not require specific treatment, per se, such as in cases of acute viral hepatitis where symptoms of hyperbilirubinemia will typically go away on their own as the infection resolves. The same applies to Gilbert's syndrome, which is not considered harmful and does not require treatment. If the condition is drug-induced, all that may be required is a termination or change of treatment. Hemolytic anemia may be treated with iron supplements. In cases of obstructive hyperbilirubinemia, surgery (usually laparoscopic) may be needed to remove gallstones or other sources of obstruction. Severe liver or pancreatic diseases would require the care of a qualified hepatologist, with treatment options ranging from drug therapies all the way through to organ transplant. Neonatal hyperbilirubinemia may not require treatment if the jaundice is mild. For moderate to severe cases, treatment may involve light therapy (which changes the structure of bilirubin molecules in newborns), intravenous immunoglobulin (which prevents the rapid breakdown of red blood cells), or a blood transfusion. While there are no home treatments able to normalize hyperbilirubinemia, you can avoid placing additional stress on the liver by cutting out alcohol, red meat, and processed foods and limiting your intake of coffee and refined sugar. The constitutional symptoms of jaundice may be alleviated with over-the-counter antacids, laxatives, or stool softeners. While increased dietary fiber may help relieve constipation, it may also increase bloating. If experiencing severe nausea or vomiting, your doctor may prescribe the antiemetic drug Reglan (metoclopramide). If you are experiencing hyperbilirubinemia or any symptoms of liver impairment, speak with your doctor before taking any medications, pharmaceutical or otherwise. Punnoose, A.; Schwartz, L.; and Golub, R. Neonatal Hyperbilirubinemia​. JAMA. 2012;307(19):2115. DOI: 10.1001/jama.2012.4070. Van Wagner, L. and Green, R. Evaluating Elevated Bilirubin Levels in Asymptomatic Adults. JAMA. 2015;313(5):516-17. DOI: 10.1001/jama.2014.12835.